The Kitchen is probably my favorite Food Network show, and a while back they made Buffalo chicken mac and cheese. 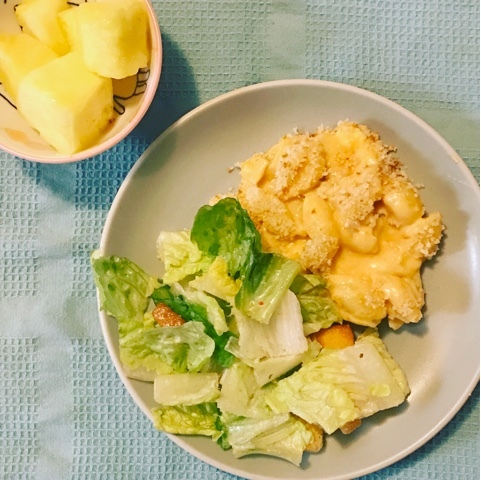 It looked amazing, so I adapted my usual mac and cheese recipe to include all the flavors -- blue cheese, Buffalo sauce, rotisserie chicken, and panko on top for crunch. The sauce is super creamy and just a little spicy. Totally addictive! 3. Heat the milk in the microwave until it is hot but not boiling. 4. Heat a large, non-stick skillet over medium heat. Melt the butter in the skillet, and then add the flour and whisk constantly until the mixture turns light brown, about 3 minutes. Gradually whisk in the milk, using a silicone-coated whisk to protect the coating on the pan. When the milk is incorporated and the mixture is smooth, cook for another 30 seconds or so. The sauce should be thick and just bubbling. Remove from the heat. 5. Stir in the grated Monterey Jack cheese, half the blue cheese, Buffalo sauce, and mustard. Taste, and add a little salt if necessary. Stir over low heat until everything is melted. 6. Add the pasta, shredded chicken, and reserved blue cheese to the sauce, and stir until combined. 7. Scrape the pasta into a 9x13 baking dish. Sprinkle with the panko. Pop in the oven for 10-15 minutes, until the sauce is bubbly and the panko is lightly browned.